Who’s on the ballot Tuesday? Polling stations in many places in the state reported low turnout. ■ Democratic voters will also have choices in local races for the US House, the Governor’s Council, state House and Senate, district attorney, and register of probate. ■ Republican voters will also have choices in local races for the US House, the Governor’s Council, state House and Senate, district attorney, and register of probate. How can I learn about my local candidates? The Massachusetts secretary of state’s website allows you to punch in your address and see the full slate of candidates that will appear on your local ballot. Go to wheredoivotema.com. ■ The Democratic primary in the 6th Congressional District. Incumbent Democrat John Tierney has four challengers: John Devine, Marisa DeFranco, Seth Moulton, and John Gutta. The winner will face Republican Richard Tisei. ■ The Democratic primary in the Middlesex district attorney’s race. Incumbent Marian Ryan faces Michael Sullivan, currently the clerk of Middlesex courts. ■ The New Hampshire Republican US Senate primary. Former Massachusetts senator Scott Brown, who recently relocated to New Hampshire, faces a primary challenge from former US senator Bob Smith and former state senator Jim Rubens. The prize: the chance to take on incumbent Democratic Senator Jeanne Shaheen, the former governor. Who’s not on the ballot? There are also independent and third-party candidates running in several races, including the race for governor. Their names will appear on the general election ballot in November but not on the party primary ballots. How do I figure out where to vote? The secretary of state’s website allows voters to punch in their home address and learn the address of their local polling place and locate it on a map. Go to wheredoivotema.com. If I’m registered as ‘unenrolled,’ can I vote in a party primary? Yes. Unenrolled voters can declare a party at the check-in table at their polling place. They will automatically revert to “No Party” status for future elections. For state elections, including Tuesday’s primary, the polls must be open from 7 a.m. to 8 p.m. If you are in line at the polls by 8 p.m., you are entitled to vote. Yes. State law requires voters to be registered 20 days before all primaries and general elections. What about same-day voter registration? Although some states allow would-be voters to register at the polls, such a system was rejected this year by state lawmakers. What about Massachusetts’ new early voting law? 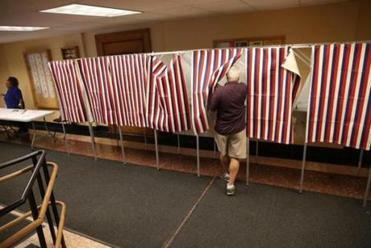 Signed into law this spring by Governor Deval Patrick, the law will allow voters to cast ballots early — beginning in 2016. Residents will be allowed to vote in statewide elections starting 11 business days before an election and ending two business days before an election. The law will also allow 16- and 17-year-olds to preregister, though they won’t be allowed to cast ballots until they turn 18. What about the ballot questions? Voters will be asked to vote on four ballot questions this year, on casino gambling, the expansion of the state bottle bill, the state gas tax, and earned sick time. There’s still time to learn the details; the questions won’t appear on the ballot until the general election in November. For more information about where the statewide candidates on the Democratic and Republican ballots stand on some major issues, the League of Women Voters of Massachusetts has compiled a Primary Election Voters’ Guide available at lwvma.org. Correction: An earlier version of this story misstated the last name of Michael Sullivan, who is running against Marian Ryan for the Democratic nomination in the race for Middlesex district attorney.